Is it your dream to find a home of your own in a far away, exotic land? If so, then A Place In The Sun magazine is the perfect magazine that you can use to fulfil your dreams! Buy a single copy or subscription to A Place in the Sun magazine. This magazine eloquently focuses exclusively on overseas property, packed full of buyer and seller guides, property purchasing advice, and heaps of great information that you can use to enhance your overseas property education and get a detailed look at the properties that are currently on the market. Considered by many to be one of the best overseas property guides, it brings together all the information you would ever want to know about overseas property, while at the same time bringing you inspiration to start following your dreams and taking the first steps to overseas property ownership. In addition to providing you some of the most spectacular property photos by professional photographers, A Place In The Sun magazine also provides you with expert advice and crucial information that any overseas property owner should be fully acquainted with. Including such things as tax information for properties abroad, detailed buying information, selling and timeshare advice, and even investment and finance advice, this magazine is your one stop for getting involved with the fascinating world of international property trade. Providing you with the best properties from around the world, A Place In The Sun features some of the most diverse countries where you can buy property today, including Egypt, Australia, Cyprus, and many others! 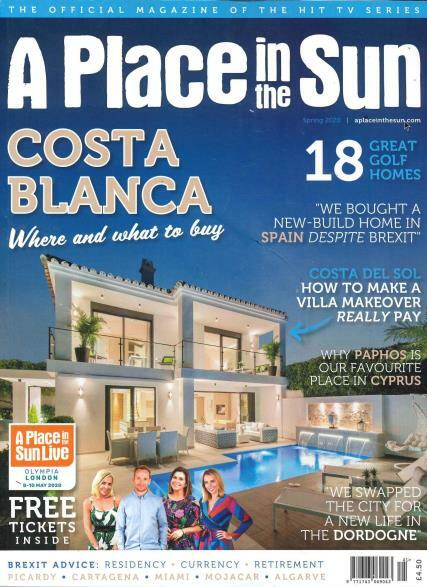 If you have ever fantasized about owning your own, beautiful overseas property or if you are looking for great investment opportunities, then A Place In The Sun magazine is sure to contain every little bit of information and inspiration that you would ever need!